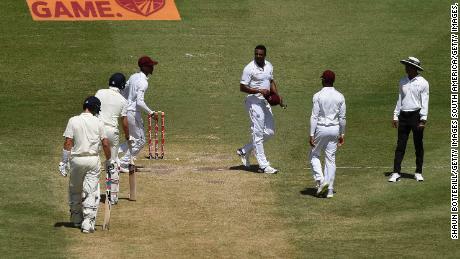 The original comment, made by Gabriel during the third Test between West Indies and England in Saint Lucia, was not audible on the microphone on the stump, and Root was coy afterward when asked by reporters what had been said. “It’s Test cricket and (Gabriel) is an emotional guy trying to do everything he can to win a Test match,” Root told reporters Monday. According to the UK’s Press Association news agency, Gabriel was spoken to by at least one of the on-field umpires about his language. 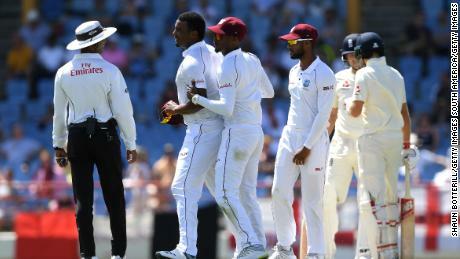 West Indies coach Richard Pybus told the BBC he had yet to receive a report of the incident but that action would be taken if anything unsavory had happened. “I think the fast bowlers are always going to try and impose themselves on the game,” Pybus added. “It’s always a proper tussle out there. I think it is pretty standard. This is not the first time a stump microphone has broadcast an on-field conversation that has led to controversy. Last month, Pakistan captain Sarfraz Ahmed was banned for four matches after racist comments he made toward South Africa’s Andile Phehlukwayo were picked up.